Today in this post I will tell you how you can easily find synonym of any word. Synonym is a word or phrase which means exactly same or nearby of another word or phrase in same language. For e.g. : Blog synonyms are communicate and intercommunicate. 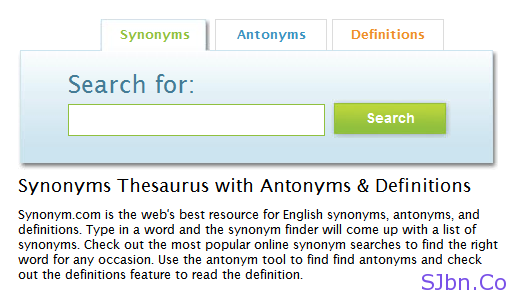 Synonyms.com is one of the website which will let you find synonyms of almost any word or phrase you type. It will categorize according to various possible senses of that word. It also let you find Antonyms and Definitions of any word or phrase. Synonyms.com have many advertisements in it so you can also use their website called Synonym.org which have very less ads and also load very fast in compare to Synonyms.com. Thanks Sarjana for the tip.